In other words, you paint your own world. It’s easy, especially for creatives, to become overwhelmed with sorry, and even with anger, but feelings don’t make a difference. Actions do. We may feel impotent, immobile in the face of forces that seem much larger than our individual strength, but every small voice counts against injustice. If something upsets you, something that feels fundamentally wrong, don’t despair. Say something. Write something. Paint something. Don’t let the enormity of the task overwhelm you. You are not alone. Someone is listening. Someone needs to hear what you have to say. This comic is for the real kitty and bunny, who sometimes get angry or depressed about the meanness that runs through humanity and frustrated by the feeling that fixing the problem is out of their control. It’s true that all the Problems of the World cannot be solved by one person, but many of the problems of the world can be solved be individuals and small groups. Sometimes just saying the right thing at the right time to the right person is enough to effect a change, to raise up one more spark of the divinity of kindness to light the world. That’s why I have to keep reminding myself never to harden my heart, and to always answer hatred with love (and also why I can never read the comment forums). I have to be ready with the right answer when the moment presents itself, whether that’s drawing a ridiculous comic in support of a doctrine of love, or speaking up when I hear an ugly microaggression being casually spewed. I mean, I’m not perfect (sometimes I do read the comment forums) but I always feel better with an open heart. I always feel better when I choose to see the light instead of set my mind to the darkness. 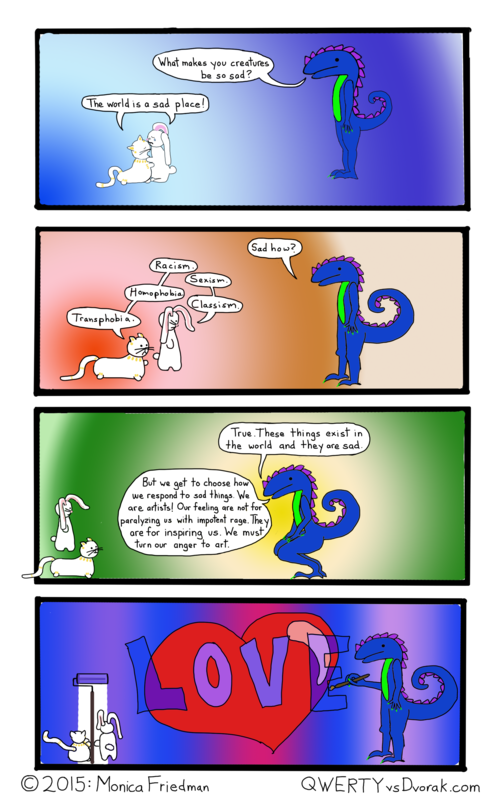 This entry was posted in comic, dragon comics and tagged art, artists, comic, dragon, fear, light, love, writers, writing on April 10, 2015 by littledragonblue.